TravelPass Trips is a prepaid solution designed for frequent travelers flying on a regular basis between two destinations or within a zone. 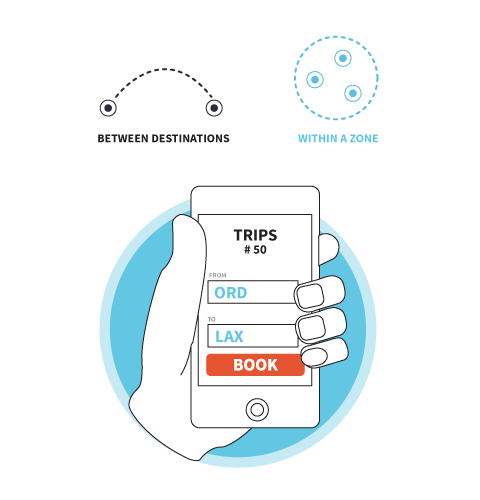 A typical product could be for instance a prepaid Trips product of 50 trips between Chicago ORD and Los Angeles LAX. The airline designs the number of trips included in the product(s), from 2 to 999 or even lifetime. Airlines can also set different business rules assigned to the products such as whether a trip should be debited at the time of booking or upon completion, giving them maximum flexibility to design products designed for their market and customers. Several products can also be combined. For example if a passenger has a Trips product between two destinations, they can also have another Trips product for other destinations and also a Pay as you fly product. The TravelPass system recognizes the different products associated with that particular customer. Read about our Unlimited and Pay-as-you-fly products.